(b) They were Bedouin nomads who had descended from Esau and lived mostly in the Negev. See Genesis 36:12,16. (c) See Numbers 14:43,45; Deuteronomy 25:17-19. Also compare Judges 3:13; 6:3-5, 33; 7:12; 10:12 which chronicle the Israelite’s battles against the Amalekites. Following the footnotes (c) The meaning of this name is “the place of the ban” ( = total destruction). It was located somewhere in the southeastern frontier of Canaan. My thoughts: God was very specific in His instructions. He wanted to leave no memory of the Amalekites on the earth. This was God’s punishment to the Amalekites – total annihilation. God is capable of incredible vengeance against those who do not honor Him. As I leave my study today it is clear that “God is Love” for those who choose to serve Him, but He is also to be feared by those who do not. My prayer today is that I will keep my focus on serving Him. God no longer wanted Saul to be King. God had told Saul to annihilate the Amalekites, every man, woman and child; all the cattle, sheep, camels and donkeys. Everything belonging to them was to be destroyed! I Samuel 15:7-21 (IEB): “Then Saul attacked the Amalekites. He fought them from Havilah all the way to Shur, which is at the eastern border of Egypt. He captured Agag (“Agag” like “Pharaoh”, was a title, not a proper name) alive, the king of the Amalekites. But he wiped out all of Agag’s army with the edge of the sword. But Saul and his army allowed Agag to live. They also kept alive the best of the flocks, the fat cattle, and the rams. They kept every good animal alive. They did not want to destroy them all. But whenever they found an animal that was weak or useless, they killed it. Saul clearly disobeyed God’s command – but he doesn’t see it that way. Twice he referred to Yahweh as “your God”, not “My God”. He doesn’t acknowledge God’s authority over him. And finally, he put up a monument in his own honor, claiming the victory as his own, not honoring God at all! The success that Saul has experienced because of God’s intervention has made him arrogant! As I leave my study today, I have to ask myself: am I giving God the credit He deserves? Do I think of Him as “My” God, the one behind every good thing there is? It is better to obey God in the first place. In yesterday’s study Saul attacked the Amalekites as God had commanded, but failed to follow God’s instructions to kill every Amalekite and all of their livestock. Samuel called Saul on this and Saul claimed that he did follow God’s commands, (although he brought Agag their leader back alive). Then he blamed his soldiers for keeping the best livestock “to sacrifice them to Yahweh, your God, at Gilgal!” Saul was trying to put a good spin on what he did, but God knew the true story. Saul realizes he is in big trouble! If Samuel doesn’t back him in front of the people it is over for him! 1 Samuel 15:30-33 (IEB): “Saul said, ‘I have sinned! But please show me honor in front of the elders of my people. Please honor me in front of the nation of Israel. Return with me, so that I may give worship to Yahweh, your God!’ Samuel finally decided to reconcile with Saul, and Saul did worship Yahweh. I leave my study today reminded that partial obedience isn’t an option. I am either obedient or I’m disobedient. And there are consequences or rewards depending on what I choose. Samuel killed Agag in obedience to God’s command that all of the Amalekites be wiped from the face of the earth, and God communicated with him. Saul chose to be disobedient and lost favor with God and his place as king over the Israelites. Samuel left Saul in Gilgal and went to Ramah while Saul went up to his home in Gibeah-Saul. Samuel never saw Saul again, but he cried for him. (d) It is possible that King Saul had warned Samuel that he would kill him, if he tried to promote a rival to Saul’s throne. Look back at 1 Samuel 13:14 and15:28. Samuel tells Saul that Yahweh is replacing him as king although Saul’s response was not recorded. Saul has been told that Yahweh is replacing him, but Saul is defiant and continues to act as king. Samuel is mourning Saul’s disobedience but at the same time is afraid of Saul. Even so He does what God commands. 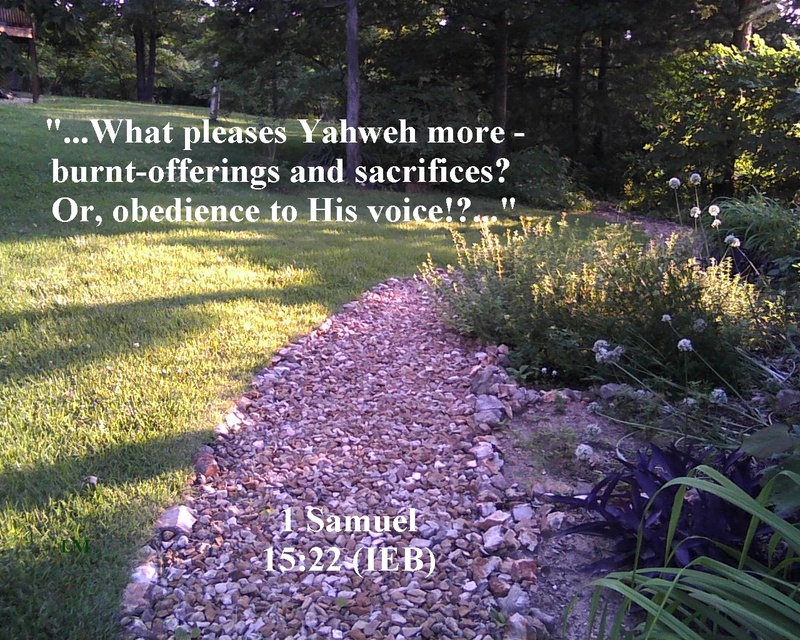 (a) The elders were apprehensive about exactly why Samuel had come to their obscure village. It was not on Samuel’s normal circuit. They were worried about any negative consequences which might befall them if King Saul found out about this visit. Note Saul’s massacre of the priests at Nob (1 Samuel 22:6-19) They had good reason to worry. My prayer today is for the courage to do what God commands even when I am afraid. (d) Compare Isaiah 31:1,3; Psalms 147:10; Ezekiel 16:52; Matt. 7:1-5; John 7:24; 2 Cor. 10:7. (e) God sees where no one can possible see. Compare 1 Chr. 28:9; Ps 7:9; 26:2; 139:1,2,23,24; Jer. 11:20; 17:10; 20:12; John 2:25; Acts 1:24; Heb. 4:13. Following the footnotes: (h) David was a shepherd. God expected David to be the shepherd of His people. Yahweh is the chief shepherd of Israel. As I leave my study today I am reminded that God sees everything I have in my heart and mind. I need to be careful what I put in there! Samuel has gone on a secret mission to choose the new king. God gave him the plan to offer a sacrifice to Yahweh in Bethlehem where Jesse lives. Samuel has looked at seven of Jesse’s sons but God has said “not this one” to each one. So Jesse sent someone to get David. He was a fine-looking young man – all tan and handsome. Yahweh said to Samuel, ‘Go, anoint him with olive oil. He is the one! (c) literally, “He causes me to lie down in green pastures” using the metaphor of tending sheep. After the sheep are completely satisfied with their grazing, they will lie down contentedly. (d) literally, ‘He restores (= refreshes) my soul” (= my life) after exhaustion. (e) or, “righteous ways”, not in the direction of ruination. (f) literally, ‘through the valley of the shadow of death,” = the deepest darkness; severe crises. (g) See 1 Samuel 17:34-36. You may seem to be alone, but God is with you; and, He will never abandon you. (j) or, “reassure me.” The rod and the walking-stick show that the Shepherd is always there for them. (k) or, “anoint” = symbolic of hospitality and gladness. As I leave my study today I have a better understanding of what it means to have God as my Shepherd. His plan is always for my good. All things are under God’s control. Saul has lost favor with God because of his disobedience. David has been anointed by Samuel in secret. He is God’s choice of king to shepherd His people. As I leave my study today it is clear that God has complete control of everything, even Satan. God was allowing Saul to be tormented because he had been disobedient; God already had David waiting in the wings to replace him at the appropriate time. God also allows good people to be tested as the story of Job shows us. Either way, God is the one in control. My prayer today is one of thanksgiving for God’s complete control over everything. In yesterday’s study, God sent an evil spirit to torment Saul with depression because Saul had been disobedient to God. Saul had sent his servants to find someone to play music so he would feel better. Then Saul sent messengers to Jesse. The message said: ‘Send me your son, David, who is with your flock.’ So Jesse loaded a donkey with bread and a leather bag full of wine. He also got a young goat. He sent all of this to Saul, along with his son David. Following the footnotes: (d) David probably made several trips back and forth between Bethlehem and Saul (1 Samuel 17:15). Apparently, David entered the service of Saul on a permanent basis in 1 Samuel 18:2. As I leave my study today, I am impressed by how complete God’s plan is. First he chooses David, a young man of God who plays the harp and makes up songs praising Yahweh. He has him anointed by Samuel to show that he was God’s choice of king (1 Samuel 16:12). David didn’t immediately become king, he went back to tending sheep. Next God sends an evil spirit to Saul which causes him to be depressed. His servants suggest that music would help. Who do the servants recommend as a musician? David of course! Just as God had planned it! This puts David right in Saul’s inner circle, at Saul’s invitation! God’s timing may not make sense to me at the time, but it is always right. It is interesting to me that David’s songs relieved Saul’s depression. It’s something to remember – singing songs praising God will lift my spirits. I may not have the world’s greatest voice, but it not how well I sing, but what I sing – praises to God – that matters. My prayer today is one of gratitude for God’s plan, and for His patience with me. I want my actions to be pleasing to Him. When Christ returns, I want to be ready. I don’t want to hear, “enough is enough”!